Seriously, how many times can you fly your little quadcopter drone around your backyard before it gets boring? 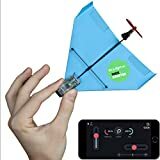 If you’re looking for a fun new twist on airborne, radio controlled gadgets, check out the POWERUP DART Aerobatic Smartphone Controlled Paper Airplane instead. It’s a fun new twist on this type of device, and it’s unlike anything you’ve ever tried before. Bring your favorite “blast from the past” to the present when you turn your paper airplane into a Remote-controlled flying machine! Powerup paper airplane conversion kit features a crash-resistant design and will give your paper plane a massive 180 ft. (55M) range – truly a gravity-defying experience.